In the second year of training for my mental health nursing degree I spent a day with the ambulance service. From a road traffic accident to a fire and a cardiac arrest, I witnessed the variety of work undertaken daily by paramedics, and the complex range of skills required to do the job. I was in a rapid response vehicle with a female paramedic, who I will call Sarah, and our first task was to ensure all our medical equipment and medicines were on board. 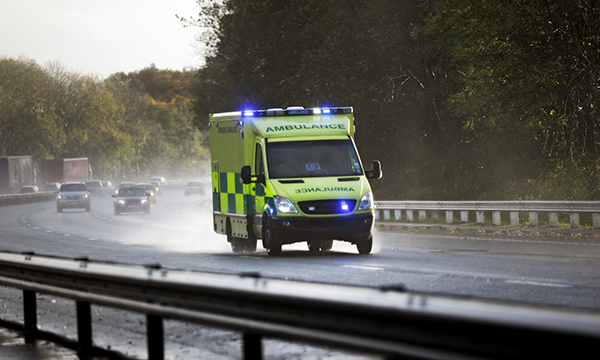 The vehicle is prepared by the night crew, but as paramedics have the same level of clinical accountability as nurses, it was vital to double-check everything – if anything went wrong due to missing or faulty equipment the paramedic would be accountable. The traffic accident was our first call. A man on his way to work had been hit by a car on a busy main road and his head had struck the windscreen. His head was bleeding and he looked shocked, but he was fully conscious and breathing. Sarah took his physical observations and asked him what had happened, whether he was in pain and where, and what medications he was taking. She also asked about his next of kin and if he had any health conditions. After she had dressed his head wound the man was strapped to a spinal board so as not to exacerbate any musculoskeletal injuries he might have sustained. He seemed in good spirits, all things considered, and even cracked jokes about getting a day off work. We took him to hospital and I observed the transfer of care to staff in the emergency department. Sarah gave a handover to the nurse in charge and completed the patient report form that is required after each incident. While waiting for our next call to come through, Sarah and I discussed her practice. From delivering babies to attending scenes where someone has died, she responds to a wide range of incidents, some of which require a great deal of emotional resilience. She said although there was a need to be emotionally strong to do the job and cope with what was encountered on a day-to-day basis, there had been incidents that had upset her. Talking to colleagues and having impromptu counselling sessions in the mess room of the ambulance station helped her to cope. But she said incidents can affect people in different ways, and it is important to have your own coping mechanisms. Our next call was a suspected cardiac arrest, so Sarah put the blue lights and siren on and drove fast. When we arrived at the house it was messy and squalid, with empty beer cans everywhere. A distraught woman told us her relative was upstairs and that she and a neighbour had tried to perform CPR, but she thought it was too late. We went upstairs and found a man’s body on the floor, but it was only when Sarah started examining him that I realised he was dead. I had never seen a dead body before, so this was quite a shock. The man, who was alcohol-dependent and had cirrhosis of the liver, was known to the service. We covered his body with a duvet but his dog, who would not leave him, kept pulling it aside. The relative was concerned for the man’s partner, who was not at home. This experience had a profound effect on me, and I became upset by the situation. I felt sad for the man’s family and offered them my sympathies. Sarah then explained how paramedics make a diagnosis of death. She showed me rigor mortis – the patient’s jaw was stiff and would not open – and hypostasis, the pooling of fluids to the lowest points on the body, which creates areas of dark red discolouration. After completing the diagnosis of death form she contacted emergency services control to check when the police would arrive. While we waited, I tried to help the man’s relative. She was shocked and hadn’t realised the extent of his problems. All this happened before lunchtime, showing just how intense and varied the life of a paramedic can be. In the afternoon we were called to a GP surgery to take a patient with suspected atrial fibrillation to hospital, attended a minor kitchen fire in a block of flats and saw a patient with multiple sclerosis who said she was in pain. This was an interesting case for me as the patient, who had multiple health conditions, made contradictory statements that didn’t seem to add up and it was unclear what was going on. Her physical observations were all within normal range, but she talked about some recent stressful events that were affecting her. Sarah thought the patient’s presentation and body language did not indicate she was in great pain, so she suggested the patient talk to the mental health liaison team in the emergency department, and she agreed to come with us to the hospital. Reflecting on this, Sarah said it was possible the patient was withdrawing from opiates and was engaging in ‘seeking behaviours’ – trying to get morphine from the ambulance or hospital staff – which Sarah had seen before. Paramedics are on the front line of emergency care. My day shadowing Sarah highlighted the complex range of skills required to manage the response to an emergency call, and the emotional side of the work. Although nursing and paramedicine are different disciplines they have skills, values and knowledge in common. Working with Sarah was a great way to see assessment skills in action, and how paramedics use observation, intuition and judgement to make decisions. 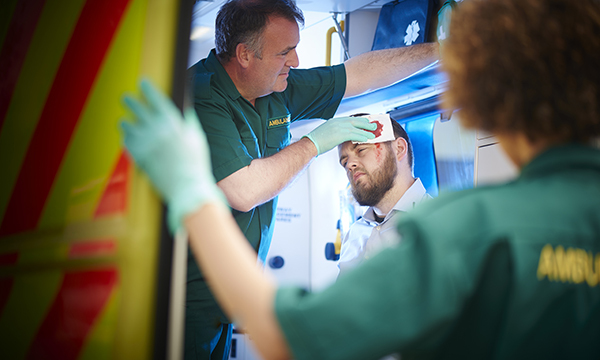 Observing the different situations paramedics face on a daily basis also enabled me to appreciate the wider social context of mental and physical healthcare, and I learned a lot from this experience that will enhance my development as a mental health nurse. With thanks to my personal tutor Elizabeth Collier for her help and advice on writing this reflective article, and for her support and encouragement in getting it published.